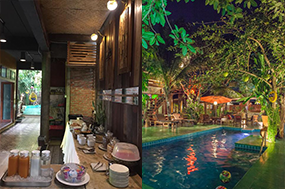 Mr Korn Tours and Travel are on site and available to organize your tours to any of the attractions in around Chiang Mai and the North of Thailand. Mr Korn and his wife Poung and their family live locally and will happily explain all the local attractions for you. Korn has been doing tours in Chiang Mai for twenty years and is one of the most experienced operators in Chiang Mai. He can organize tours to the standard attractions or organize for you a personal tour as per your own wishes. Mr Korn drives a late model Toyota Hilux which is perfect to get you to the most inaccessible places. All tours are reasonably priced and we want you to be satisfied, tell your friends, and return. © Copyright 2013 - 2017 De Wiang Kum Kam - All Rights Reserved.